Career planning—discovering who you are and what you are meant to do—is lifework. It’s a process and a journey. As with most things in life, you'll get out of it what you're willing to put into it. At the Career Center, we’ll help you decipher just what your college experience means in terms of your career options and choices. We'll help you to see how the workplace today is changing, and what employers look for when hiring new candidates. We'll also help you to understand yourself well enough to know your best fit. Counselors can help with your Career Action Plan (CAP), career exploration, major exploration, career assessments, resumes, job searching, mock interviews, internships, the graduate school process or any aspect of career development. Make an appointment with a career counselor today. Call 301-447-5202 or drop in to see us in McGowan Student Center any Tuesday or Wednesday between 1 and 2 p.m.
A résumé is a brief summary of your qualifications, education and experiences relevant to the internship or job search objective. The purpose of a résumé is to obtain an interview. Employers will spend 30 seconds or less reviewing your résumé; therefore, the information must be conveyed in a clear, well-organized style. Writing a perfect résumé is an art and can take time. A résumé is a working document and will need to be revised frequently. There are many different formats a résumé can take, namely a chronological résumé or a functional résumé. The primary purpose of a cover letter is to give you the opportunity to portray your personality and writing style, as well as explain why you are a good fit for the position or organization. Please view our Cover Letter Guide for suggestions on how to write a meaningful cover letter. The On-Campus Recruitment (OCR) Program is an opportunity for students to interview with employers for internships and permanent positions. Interviews are held in the Career Center. To be considered for these positions, you must register and submit your resume on MountHired at least one week before the company’s interview date. To contact the Career Center about on campus recruitment, call 301-447-5202. The Career Action Plan (CAP) is a four-year program that guides students through a systematic career development process. Each year of the CAP includes a checklist of suggested activities to develop a student's skills and career readiness. As a first-year student you'll discover new friends, new experiences, and new knowledge. You'll learn to appreciate the talents and abilities you have to offer and will begin to develop new skills and interests. Take an active role in your learning. Maintain a good grade point average. Use MountHired to complete a personal inventory of your interests, values and skills, and to explore majors and potential occupations. Check your Mount email. There are many opportunities and information that the Mount will share with you on email. Build a support network of faculty, administrators and professional contacts. Apply for summer jobs, internships or volunteer positions that will expand your knowledge of the world of work. Think of yourself as a professional. You are not "just a student,” but rather a professional who is juggling classes, assignments, extracurricular activities, and perhaps a job. Your focus as a sophomore is to explore majors and careers and to appreciate who you are and what you value in relation to the world of work. Continue to explore your academic interests through the Core Curriculum and electives. Use MountHired to assess your skills and interests and to explore possible majors and career fields. Schedule an appointment with the Career Center. Let us help you with decisions about your major, with your resume, and in exploring internships or summer jobs. Update your resume and upload it to MountHired. Meet with your academic advisor to officially declare your major. Participate in college-sponsored internship and job fairs. Shadow and observe professionals in their workplace. Work toward a leadership role in a club or organization. Get involved in community service activities. Secure an internship or summer job in a career field of interest. Get ready to make some tentative decisions about your graduate school and/or job search plans. Begin to map out your strategies. Identify at least three career and/or graduate or professional school options that match your interests. Discuss your options with your academic advisor or a career counselor. Have your updated resume critiqued by the Career Center. Build professional experience through an internship, volunteer, or summer job. Begin to research internships on MountHired. Develop your network of contacts. If considering graduate school, use the Career Center resources to research programs, entrance exams and application deadlines. Attend career and graduate school fairs. Begin to research organizations and the opportunities they offer. Assume a leadership role with a club or activity. Join student chapters of professional organizations. Demonstrate your competencies in teamwork, leadership, technical and communication skills. Consult with your graduate or professional school advisor or set up an appointment with the Career Center for assistance with the process. Register for and take the appropriate entrance examinations. Narrow down your choice of schools and obtain the applications. Prepare your personal statements and applications. Submit application materials on time and check with the institutions prior to the deadline date to make sure your file is complete. If possible, visit with institutions that accept you. Send a deposit to your school of choice. Notify other schools that have accepted you of your decision. Your challenge as a senior is to integrate the experiences, knowledge and self-discovery of the past three years, decide on a career path that is right for you, and take the necessary steps to make it happen. Upload your revised resume to MountHired and search for positions. Draft a cover letter that can be adapted for a variety of audiences. Participate in a videotaped Mock Interview. Decide on the type of professional work or graduate program you're seeking. Get an internship or related work experience if you haven't already. Design a campaign strategy and a timeline for your post-graduate plans. Take a leadership position with a club or organization. Identify people who will be references for you. Ask them if they are willing to serve as a reference and give them a copy of your resume. Consider spending a year after college as a volunteer with AmeriCorps, the Jesuit Volunteers or a similar program. Narrow down the geographic region in which you'd like to work. Check the Career Center Calendar and register for appropriate on-campus interviews and resume referral companies. Develop an employer prospect list and schedule off-campus interviews. Tap into your network for leads, advice and assistance with your job search. 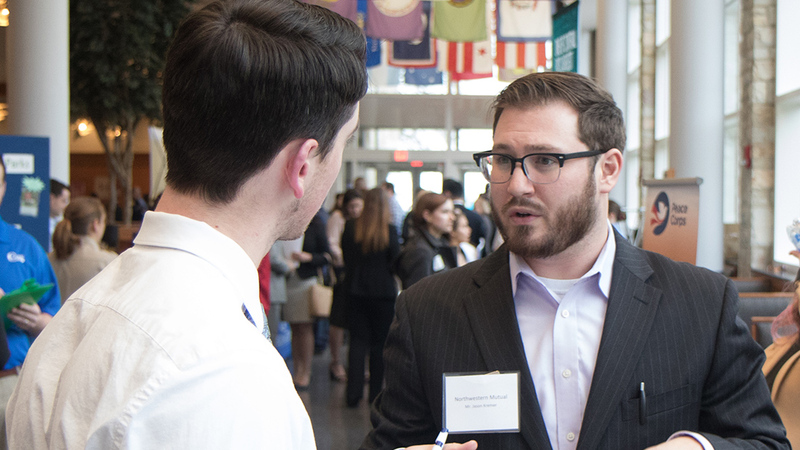 Attend local and regional job fairs to connect with potential employers. Research openings listed on various websites and post your resume. Be prompt in responding to employers' requests for interviews or job offers. Interviewing can be stressful. It is important to prepare for all of the questions a potential employer may ask, and to know yourself well enough to provide an honest and compelling argument for why you are the best candidate for the position. The Career Center offers tips for interviewing and mock-interview sessions that can make the process a lot easier. Set up a mock-interview with a career counselor to learn tips on how to present yourself.